Sandy Bottom is super modern, sleek, and chic. I love the panoramic ocean views, easy access to the beach, and the fire pit. The interior is just as nice, with an open-concept design and top-notch appliances in the kitchen. Contemporary villa with phenomenal views! Sandy Bottom sits on Providenciales’ south shores overlooking the turquoise Caicos Banks. Not only does this villa have design inspired by Frank Lloyd Wright, it’s also fully air-conditioned and solar-powered. The villa has a small private beach, and there’s a built-in fire pit on the sand for evenings under the stars. The villa’s exterior is crisp and modern, with an oceanfront infinity pool and an elevated lounge area. A sunken bar and grill is next to the pool, and there’s a daybed surrounded by glass windows attached to the pool. The elevated lounge area holds living and dining space and leads into the kitchen. Inside, the kitchen has bar seating for five and a dining table for ten. The kitchen is outfitted with sleek cabinetry and stainless steel, built-in appliances. Sandy Bottom’s open-concept common area features a music system and cable TV for guests’ enjoyment. This beachfront home has four bedrooms spread throughout two levels. The pool level has three king suites, and level two holds the master suite. One of the pool level suites can be made up with twin beds or a king bed. 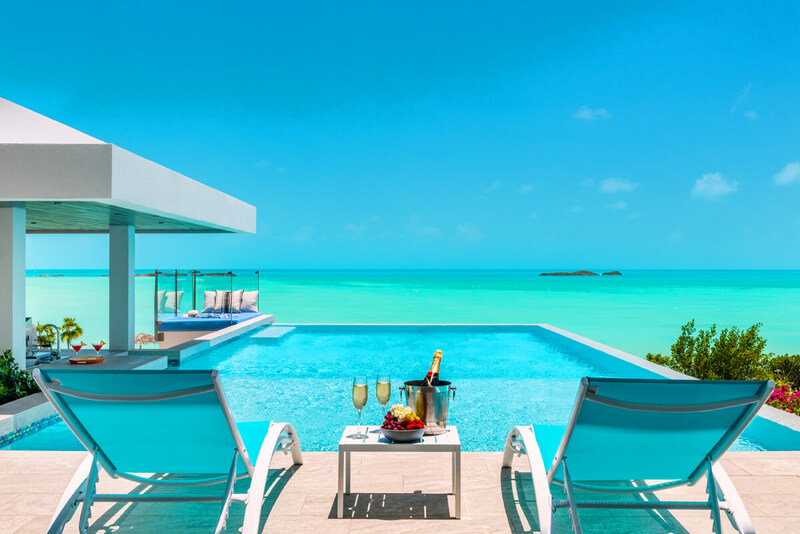 The master suite offers an elevated view of the Caicos Banks and panoramic views of Flamingo Lake. All four suites have a flatscreen TV with cable, an ocean view, and exterior access. The third level is designed as a guest lounge with large, comfortable furnishings and gorgeous views of Turtle Tail, Flamingo Lake, and the Caicos Banks. Grace Bay is less than ten minutes away, and there’s several restaurants and activities to visit. The villa is maintained by daily housekeeping, so guests can fully relax at Sandy Bottom. Upon arrival guests will secure a rental vehicle or taxi and drive to the villa using the directions provided.